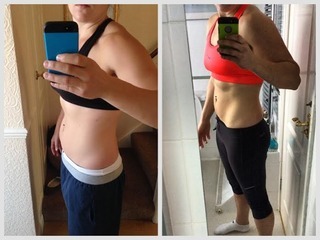 I’ve been a member at Nicfit since September 2013 and I can honestly say it was the best thing I ever did, not only have I met some fab people I have met the best PT’S ever and Just sending out a MASSIVE thank you to you awesome pair (Palmer & Rook). I couldn’t of done it without you. I’ve always carried extra weight even from a young age but it wasn’t until I was 18 and at my biggest that I decided enough is enough it’s time to do something about it so I started my weight loss battle by joining weight watchers which got the ball rolling but that wasn’t enough so I joined a local gym but after a few months it became monotonous and I really struggled to motivate myself, not long after a friend mentioned trying her gym. It just meant I had further to travel but I thought I’d give it a go anyway as I didn’t have anything to lose and 2 years onI’m still going. The end of October this year I decided to take part in the six week challenge just to see how much willpower/dedication I actually had and after following the nutrition plan and doing daily challenges set for the entire 6 weeks I can proudly say I did it(and certainly couldn’t of done it without the support and encouragement from everyone at Nicfit) and I’m absolutely chuffed to bits with my results. I feel like a totally different person with a lot more confidence.